This is my last post regarding the novel, Atlas Shrugged. As I have mentioned in previous posts, this book does a great service in presenting artistically those characters found in each of the seven Galleries of my book. The most interesting characters are those found in the last three galleries of my book. All of these characters accepted the call to adventure earlier in their lives. Some of the characters could not withstand the forces against them and soon returned to Gallery Three. Other characters exhibited the four cardinal virtues required for a successful adventure to secure the boon for society; however, they were denied entrance to Gallery Seven due to the lack of love by those close to them as well as society at large. Only one character, John Galt, was able to cross the threshold, with the love of another, and reach happiness. It is with John Galt’s love of those in Gallery Six that each character was able to be pulled across the threshold. Upon crossing the threshold to Gallery Seven, each of these characters presented their individual boons to society while attaining individual happiness. It was these boons that were so greatly needed by society to flourish, or indeed survive. By the way, Ayn Rand presented the characters found in Gallery Six as individuals who were able to develop the four cardinal virtues during a time in the novel in which the USA was a capitalistic society. Once the USA became socialistic, those in society were unable to develop the cardinal virtues needed for the adventure. As such, the citizens neither reached happiness nor captured the boons of use to society. Only those characters who had attained the cardinal virtues during a capitalistic society were able to reach individual happiness and present the much needed boons or gifts for the future benefit of society. I hope you have the opportunity to read Atlas Shrugged but only after reading my book. My book will aid in better understanding the novel. 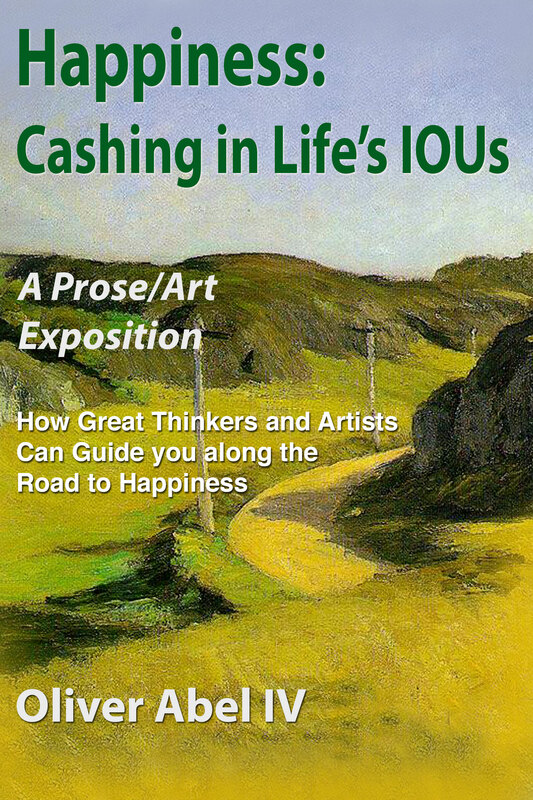 I am off to find a new book that can help to capture artistically the road to happiness in the next life. I will begin posting once I have read this new to be determined book! This entry was posted in Atlas Shrugged and tagged Atlas Shrugged, Ayn Rand on March 7, 2017 by oliver. In my previous post I mentioned that Atlas Shrugged does a great job in presenting artistically those in the sixth gallery of my book. The individuals possess the four cardinal virtues of wisdom, courage, temperance, and justice. Unlike the other three cardinal virtues, the virtue of justice is less concerned with the individual and more concerned with the condition of one’s family, friends, and society at large. It is this final virtue that propels the individuals in Gallery Six to the threshold of Gallery Seven. But only one man has completed the threshold crossing to the seventh gallery and happiness, John Galt. This individual has been brought over the threshold by one thing – love. It is the love of another woman that frees John Galt and affords him a successful crossing to the seventh gallery. Her love allows John Galt to present his boon to society. It is the acceptance of this boon by society that allows all the other individuals existing in Gallery Six to successfully cross the threshold to Gallery Seven. Not only do these individuals achieve happiness but, more importantly, their individual boons are presented to society. These boons are of such great importance that society is saved from destruction. In essence, in return for their achieving individual happiness, all the others in society benefit as well. Aristotle mentions that the four cardinal virtues are requirements for traveling the road to happiness. However, it is Aquinas, who agrees with Aristotle, but who adds one final requirement – love of neighbor. It is this love that provides ultimate happiness to those in Gallery six and the general flourishing of society upon their entrance of Gallery Seven. This entry was posted in Atlas Shrugged and tagged Atlas Shrugged, Ayn Rand on February 21, 2017 by oliver. I mentioned in my previous post that Atlas Shrugged presents the sixth gallery of my book better than most of the fine arts. This sixth gallery is represented by individuals that have recognized and accepted the call to adventure, won the trials to capture the boon, and are at the threshold of happiness awaiting their fellow citizens to pull them across the threshold. In Atlas Shrugged, these individuals are: artists, academic professors, industrialists, entrepreneurs, thinkers and managers. They each have a boon or gift to present to society – a gift that was seized during their adventure. Unfortunately, during most of the novel, society is not interested in recognizing their efforts. As such, they remain in this sixth gallery wit the boons/gifts unavailable to others. As I was reading the chapter of the novel most devoted to these individuals, I could not help but think about the Shakespeare poem that is found in my book. The following is the poem from the play, As You Like It. This is a song praising a life in the forest, away from the demands of the sophisticated court. The character, a wealthy member of the court, expresses the sentiment that it is much easier to bear the hardships imposed by nature than the cruelty all too often found in human society. This is a song in praise of a simple life lived in contentment, away from the demands of those in society. However, this is not necessarily Shakespeare’s conception of happiness. He was presenting the reality of the day: the Elizabethans were active, ambitious people constantly seeking wealth and power. This piece represents the adventurer who has decided not to return to the everyday world but remain in the Adventure. The adventurer knows that this is not happiness as the winter has “rough weather.” The poem expresses the concern that the risks of returning to society are too great and a life lived in the Adventure would be better than one lived among others in general society until such time as society become one more accepting of those offering a promising new approach to life. This is exactly what Atlas Shrugged addresses. In society, there are a number of great individuals that have captured the boon of their adventure but have decided to remain in the adventure until such time as society is ready to recognize their efforts and help them across the threshold, with their boons for the benefit of society. This entry was posted in Atlas Shrugged and tagged Atlas Shrugged, Ayn Rand on February 14, 2017 by oliver. The philosophy underlying Atlas Shrugged draws heavily from Aristotle and another unlikely source – Aquinas. The reason that Aquinas is an unlikely source is that Ayn Rand, the author, had little respect for religion: Ayn Rand was an atheist. Aquinas relied heavily on the teachings of Aristotle; in fact, Aquinas’ teachings about the road to happiness were very close to those of Aristotle, but with one vital addition – love of neighbor. Aquinas believed that no one could reach happiness in this life without that love from another. This point is one of the many major hallmarks of the novel. In fact, only one character in the novel actually reaches happiness, the seven and final gallery of my book. In the book, that character is able to pass easily between the everyday world and the world of the virtuous. Several of the book’s characters hear the call to adventure but decide to ignore it. Each of these characters is destined to a life of despair and loss in the everyday world. They will be forced to travel a very hard road in isolation. Such a character who has ignored the call to adventure is brilliantly presented near the end of the book. Many of the book’s characters hear the call to the adventure, accept it, but fail in their quest, not being able to withstand the forces against them. Some of these characters die a violent death but with the knowledge that they gave their best to the adventure. Other characters survive the trials only to return to the everyday world to perhaps try again at a future time. One of the more interesting set of characters are those who recognized the call, accepted the call, fought the trials and won, but are awaiting the entrance to happiness. These characters are described in great detail in the book. They are ones who are at the threshold of happiness awaiting the help of others in the everyday world to pull them from the adventure across the threshold back to the everyday world. These characters possess great boons or gifts for society, but ones available only if society aids them in their crossing of the threshold. It is this group of characters that I would like to discuss in my next post. These characters are the ones that have made it to the sixth gallery of my book. It is in describing the lives and actions of these characters that Atlas Shrugged greatly adds to the understanding of the road to happiness. This entry was posted in Atlas Shrugged and tagged Atlas Shrugged, Ayn Rand on February 7, 2017 by oliver. I just finished ready a book that I have never read before – Ayn Rand’s Atlas Shrugged. I am so astonished by how well the book follows the seven galleries found in my ebook that I have decided to make this book a highly recommended companion to my ebook. It is a must read, but only after first reading my ebook. The reason for my excitement about this book is that it lays bare the road to happiness in this life (not the afterlife) in an artistic fashion that only a great novel can deliver. In addition, the book illustrates with additional clarity those individuals existing in the last three galleries of my ebook. This additional clarity afforded by the artistry of the novel enhances the impact of the fine art masterpieces presented in my ebook. The prose and art found in my ebook, coupled with this novel, leave little left to discuss regarding the road to happiness in this life. The two books as a pair offer about as clear and convincing roadmap to individual happiness in this life: you need not search any further. It is all there for you to discover your individual happiness. I will be discussing more about this book in upcoming posts. This entry was posted in Atlas Shrugged and tagged Atlas Shrugged, Ayn Rand on January 31, 2017 by oliver.